Henschke Wines - Write for Wine: It's Wine O'Clock Somewhere!Write for Wine: It's Wine O'Clock Somewhere! 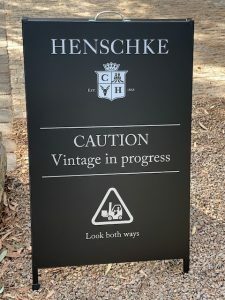 Our visit to Henschke’s Cellar Door was one of the highlights of our trip to Australia and New Zealand last month. Indeed, the experience and the wines were both exceptional. Therefore, this post focuses on our experience, and on Henschke’s history. The second post will focus on the beautiful wines. 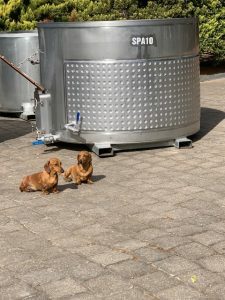 Two cute little dogs greeted us, while guarding the wine-making process. They were hard at work, as you can see, because Vintage (aka “Harvest” in the U.S.) was in progress. It was late summer in southern Australia. First, we toured the facilities and learned about the grapes being fermented. But mainly, we tried to keep out of the way of the production crew, working hard to make the next vintage of excellent Henschke wines. Instead, we learned about the storied and captivating history of Henschke. 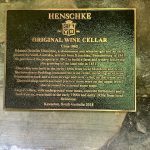 As you can see in this plaque, Henschke’s original wine cellar dates back to 1862. 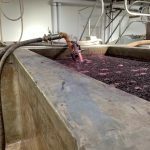 For 157 years, six generations of the Henschke family have been making wine. It all began when Johann Christian Henschke moved to southern Australia in 1841. Six years later, he became a naturalized citizen and was eligible to buy the land that later became acreage for the family vineyards. In 1862, Johann and his son Paul planted a small vineyard of Riesling and Shiraz. Of note, Johann built the cellar from field stone, brick and mud in the original grain barn. The family purchases and vineyard growth continued through subsequent generations. Stephen and Prue are working together toward sustainability in their vineyards using organic and biodynamic principles. In 2010, Prue won the Advantage South Australia Sustainability Award for the Barossa Region. 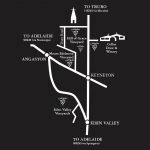 Henschke owns five vineyards: Hill of Grace, Mount Edelstone, Home Gardens, Eden Valley and Lenswood. Notably, the Home Gardens features a small block of vines planted on the family farm in the 1860s. The family bought the Eden Valley property in 1966, 100 years after the region was established. Henschke boasts a strong portfolio of wines, with a focus on ultra-premium single-vineyard wines. 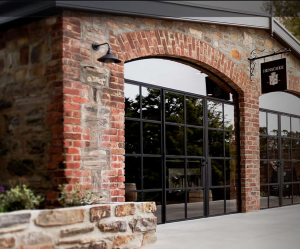 At their Cellar Door, you can taste through a lineup of simply gorgeous wines, as we did. And you can choose from about 50 wines, library wines and gift packs on their order form. Their outstanding wines will be featured in our next blog post, coming soon. Meanwhile, you can discover more about Henschke’s vineyards, sustainability, and history on their detailed website. 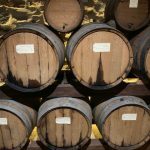 This entry was posted in Australia, Riesling, Shiraz, Wine, Wine Travel and tagged Australia, Barossa, Cellar Door, Eden Valley, Henschke, Hill of Grace, Lenswood, Mount Edelstone, Riesling, Shiraz, southern Australia, sustainability, wine, wineries by Margot. Bookmark the permalink.